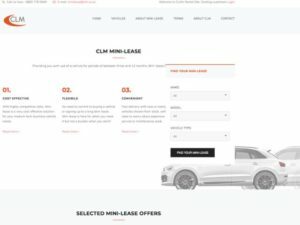 CLM has launched a new dedicated website for its Mini-lease range of products following a surge in demand from corporate customers, both small and large. The fleet management specialist has seen bookings for its flexible, short-to-medium term rental product increase by 30% year-on-year and the new site enables firms to find and book Mini-lease vehicles more easily, with increased information and support. Vehicles range from small cars up to large-sized vans across a large number of manufacturers and are available for durations from three to 12 months. Customers can also choose specific makes and models. Chris Mitchinson, CLM director – in life services, there were a number of reasons for the increase in bookings in Mini-lease products in recent months, including declining economic and financial confidence in the market, partly down to Brexit, as well as uncertainty over the tax impact of the switch to WLTP. He added: “It is also worth noting that Mini-lease may be of great interest to those organisations operating under international accounting standards which will, under IFRS16, be required to show on their balance sheet all liabilities for leases, unless the lease term is 12 months or less. The short-term nature of Mini-lease means that this does not apply.